Eagles head coach Chip Kelly has been accused of racism and being a control freak who does not tolerate dissent. Photo by Webster Riddick. PHILADELPHIA—By now you all have heard about Brandon Boykin’s remarks regarding Philadelphia Eagles Coach Chip Kelly after he was traded to the Pittsburgh Steelers for a fifth-round draft pick. It was originally interpreted as Kelly having a problem with African-American players and was viewed in the same was as similar accusations from former Eagles players LeSean McCoy, DeSean Jackson and former assistant coach Tra Thomas. A day later, Boykin clarified his remarks saying he wasn’t calling Kelly a racist, but that he has a hard time relating to players. A recent story by the Bleacher Reports’ Mike Freeman confirms what Boykin was saying about Kelly’s need to have total control over everything. While Boykin shed further light on what he meant, the perception that Kelly has a problem with African-American players lingers on with more than a few African-Americans fans. On some level it’s understandable, especially from those fans who are still upset over the incident in which wide receiver Riley Cooper dropped a fair amount of N-Bombs at a Country Music concert. As Black men, society often views us with suspicion, especially if we are seen as outspoken or show any form of anger. Even the most liberal of white people and among African Americans themselves, that perception exists. That said, I don’t think that either Kelly or the Eagles as an organization are racists. However, I do think that Kelly is trying to make the Eagles into his image from a football standpoint, and that has led to the clashes he’s had with veteran players. For example, two-time Pro Bowl guard Evan Mathis, who is white, was let go after he started demanding more money. As for the decision to trade Boykin, it was logical given Kelly’s mantra that says big people beat little people. As good as Boykin as a cornerback in nickel (five defensive backs) situation, he simply did not fit into what Kelly wanted for his defense. Boykin is listed at about 5-foot-9, maybe 5-8. In the wake of these allegations from his former players, Kelly needs to have a sit-down with not only his Black players, but his entire team just to let them that he’s accessible. One of the complaints that Boykin made was that Kelly couldn’t relate to players outside of football. Kelly said that he has an open-door policy with his players, but the workday is very structured during the offseason and during the season. At some point, Kelly is going to have to take a look at how he relates to players, who are grown men and not college kids whose scholarships you can yank if they don’t fit in with your program. 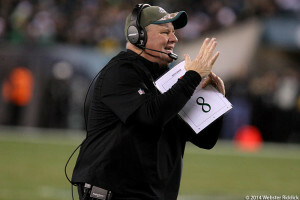 If the Eagles are winning on a consistent basis because of Kelly’s moves, all of this will be forgotten. But if wins don’t result from all of these moves, you’ll hear more noise about Kelly’s relationship with his players. If that happens, Kelly will be the one having to find a new relationship.